NetBotz is an active monitoring solution designed to protect against physical threats, environmental or human, that can cause disruption or downtime to IT infrastructure. This scalable suite of networked appliances, sensors, access controls and cameras is designed to safeguard environments ranging in size from network closets to data centers. The modular design allows for common sensors among the NetBotz appliances. Optional user-defined alerts can be sent in a variety of formats and are easily integrated into event escalation policies. For management of multiple NetBotz appliances, use InfraStruXure® Central. InfraStruXure Central with Surveillance collects, organizes and distributes critical alerts while enabling a single view of multiple cameras, rapid search and retrieval of video and 'tagging' of important video clips. 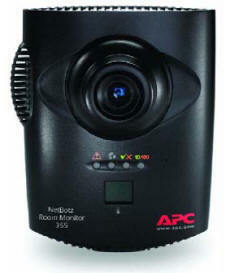 The NetBotz 300 offers the best value for security and environmental monitoring over the network. 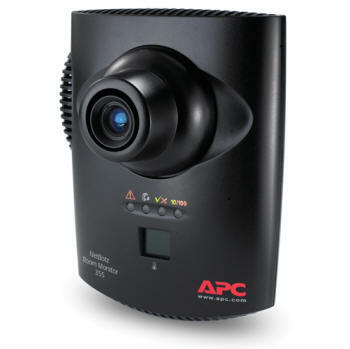 An integrated camera allows video surveillance and monitoring to record human activity. It provides temperature, humidity, door contact, dry contact , 0-5V, spot leak, vibration, and smoke monitoring. Additional features like integration with InfraStruXure Central, Power over Ethernet, and user-defined alerts make the NetBotz 300 the perfect unit to protect your IT assets from security and environmental threats. The NetBotz 300 can be used in network closets to data centers, but it is commonly installed in network closets and server rooms. 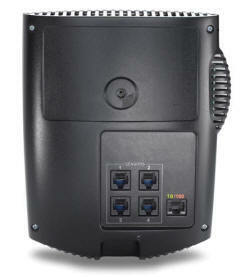 Wall mountable Ideal for Network Closets and Server Rooms. Connectors Ethernet: 1 10/100 Base-T Ethernet Port (PoE enabled), (4) APC Universal Sensor Ports, 1 USB Configuration Connectors Port – Style B Ethernet: (1) 10/100 Base-T Ethernet Port (PoE capable), (4) APC Universal Sensor Ports, (1) USB Configuration Port – Style B, (1) USB Port – Style A, (1) Microphone Jack, (1) Speaker Jack, (1) A-Link Port. Use of Advanced View interface requires a one-time download of the Sun™ Java Runtime Environment™. Microsoft Windows (Vista Business and Enterprise, XP SP1-3, 2000), Red Hat EL4 and EL5, 512 MB RAM. Download the NetBotz 300 Datasheet (PDF).